Is the Flower of Life an Inter-Dimensional Portal? Fractals are repeating, geometrical patterns that are found in nature and in human creations throughout history, from indigenous cultures to modern ones. Their regular occurrence in the environment, from animals and plants to atoms and stars, has been confirmed with scientific study. Pythagoras, Euclid and Plato, among many other, ancient philosophers, have concluded that the patterns are inherent to the design of life itself. It’s as if they are a blueprint for the matrix upon which our reality rests. The prevalence of fractals in the human design of ancient places of worship has sparked questions about the significance of the patterns; most specifically – why were they used so often to decorate places of community and worship? What knowledge did the ancients have about fractals that the modern world has lost? Is it possible that these patterns had a purpose beyond simple artistry? The question of whether the ancients had a specific utilization for the fractals is a logically valid one, for we must wonder that if these patterns truly do form the basis of the design of all things, then are all things accessible through the patterns? Fractals have become deeply ingrained within our subconscious because they occur frequently in nature and in human design. The information they convey resonates with our all-knowing awareness because they speak the universal language of mathematics. Symmetrical in design, they impart an intuitive representation of harmony, equilibrium and wholeness. 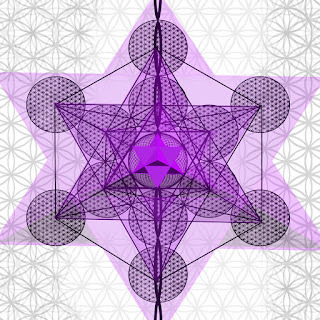 Simply gazing at a sacred geometricpattern has the potential to alter your frequencies to invoke balance, healing and change within you. It’s also an effective tool to calm the mind, thus invoking the meditative or trance-like states of awareness that lie beyond waking consciousness. The Flower of Life: Interdimensional Portal? The Flower of Life is said to be the most sacred fractal pattern in the universe, encompassing the essential shapes and connections intrinsic to every aspect of our physicality. It occurs when a repetition of symmetrically balanced, overlapping circles are placed within a six-fold symmetry. This pattern is one most frequently found in ancient temples, in nature, and even in modern churches. 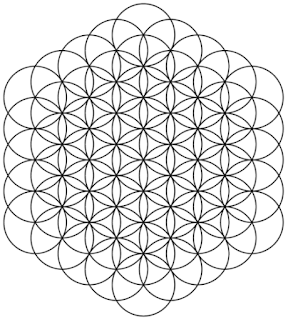 The most common image of the Flower of Life is a simplified, two-dimensional version of the original, since it is in print form. The complex version of the Flower of Life image is created by the over-laying of the basic fractal with the three-dimensional, Platonic solid figures, creating a more multi-dimensional representation of this geometry. The complex pattern that results from this specific combination is the one most often attributed to use as a meditative tool. Although the specifics of this pattern are beyond the scope of this article, it is a trending topic amidst today’s metaphysical and spiritual communities, particularly for its use as a meditative tool. Many have described altered states of awareness after gazing at the image for 10-30 minutes. Some have claimed that images and faces seem to protrude from the picture, while others report an increase in psychic skills, the ability to communicate with the deceased, and visions into parallel dimensions – all from meditating on the image. 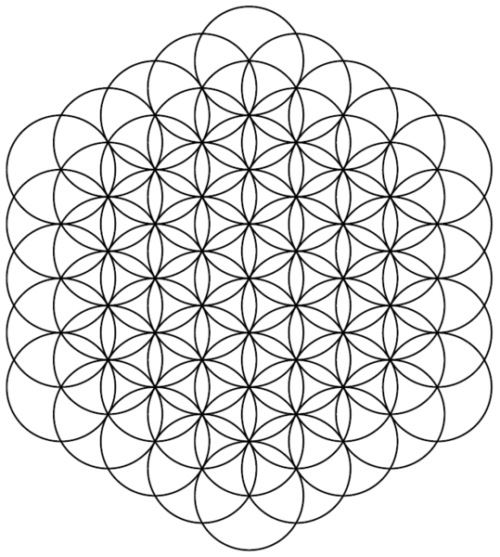 Is it possible that the Flower of Life is more than a geometric pattern? Can it really be a portal to dimensions beyond this one? Furthermore, does it possibly hold the key to unlocking the mysteries of our universe? Try the Flower of Life Meditation! Enlarge the black and white image on your computer screen, or print out an enlarged version and attach it to a wall. Sit back 1 to 3 feet from the image and face it. Relax and breathe long and deep. Allow your eyes to go into soft focus while gazing at the image. Try not to focus at a set point, rather allow your subconscious to take the whole image in at once. The image may appear fuzzy or go out of focus. This is fine. Allow images to come through the design, knowing that whatever comes through does so for your highest good. When you are finished, take some time and record your impressions. Note how you feel, what thought flashed through your mind, or what you saw. Try the practice regularly to allow the chance for varying results to occur. *Before you begin, it may be important to note that some have reported frightening images. This is why it is important to declare your intention to yourself, as a way to protect yourself and attract only the highest frequencies available to you. If something does come through that scares you, simply close your eyes and end the practice. The concept of a multi-dimensional universe is a relatively new field of theoretical research. While we can suspect that there are limitless boundaries and potential yet to be discovered, taking this field from theory to proof is no easy task. It may take a courageous persona, and out-of-the-box methods such as these, to gain any ground. But the good news is that there is opportunity for anyone who is willing to become a pioneer of the unknown. If you try this practice, let us know how it goes.